Watermelon can be diced, sliced, balled or blended, and it provides several health benefits. Watermelon contains higher levels of lycopene than any other fresh fruit or vegetable and is a source of vitamins A, B6 and C, as well as potassium. Add that to the many benefits of collagen, and you've got an health drink so delightful, we dare call it "creamsicle." In blender, combine watermelon, collagen and heavy cream; blend. Collagen is a structural protein available as a supplement in the form of a tasteless powder. It has been known to help improve joint and digestive health, but consult your doctor or a dietitian for more information. 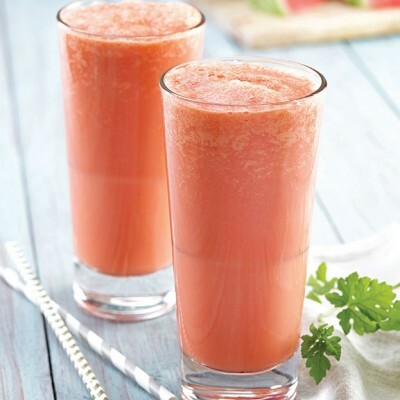 Pair this smoothie with a savory-sweet watermelon wrap.